What is a hot dog waffle maker? Are you ready to have your mind blown? There is a hot dog waffle maker machine! Of course, there’s nothing stopping you from taking hot dogs, covering them in waffle batter and then putting them in your best waffle maker you can afford.. It will squish the hot dog but it will make an interesting snack! However, that’s not what I’m talking about. These days, the sky’s the limit. Or should I say, you’re only limited by your creativity. What we’re reviewing here goes right along those lines. It’s a device that straddles a few different areas. Have you ever thought you could mix hot dogs with waffles? First, what is a corn dog? A corn dog is a classic county or state fair snack. It’s a hot dog on a stick, dipped in a corn based batter and deep fried to golden perfection! Nowadays you can buy frozen corn dogs, but why would you when there are so many great and easy to do corn dog recipes online. So what happens when you dip a hot dog in waffle batter? Would that make that more of a corn dog? Maybe, kind of. Want to run a stick through them and really make them like a corn dog, go for it! Want to take the waffle dog and put it in a bun or just eat it like that, go for it! Should you put mustard or Nutella? Either way is fine, go for it! When looking through Amazon I noticed some waffle maker corn dog types of appliances and boy were they expensive! HUNDREDS of dollars. That’s just not realistic for most of us. However, I did find one kitchen appliance that came in very reasonably priced, so reasonably priced that it can’t be beat. 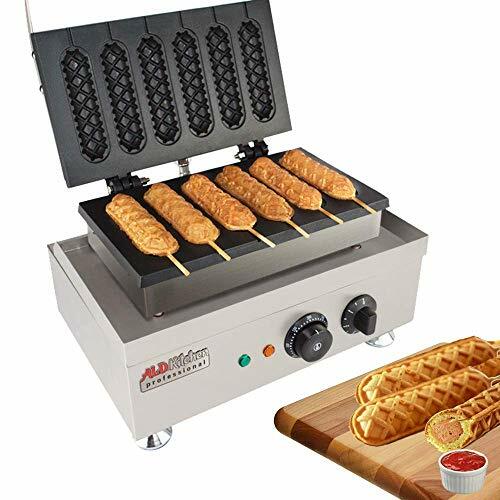 These expensive waffle maker hot dog machine thingys may be great for commercial use- if someone wants to run a bakery or a coffee shop – they could be used to make these waffle dogs into a signature treat. However, for most of us, this inexpensive appliance will do just fine. Just for fun though, here’s the commercial one. It’s interesting to read through it’s features! This crazy expensive commercial waffle iron makes it possible for you to bake a waffle on a stick. A brand new concept that is getting extremely popular all over the world and can be fun for families. The specially designed grids allow you to bake 6 waffles at a time. It has a non-stick surface that can be cleaned with any device without running the risk of scratching or damaging the baking surface. Baking time is about 1-5 minutes to bake an entire tray. Now lets talk about the more realistic hot dog / corn dog waffle maker machine. I’m not even sure what it call it but it’s technically a corn dog maker. Smart Planet isn’t a company that you hear much about but they are an innovative one. 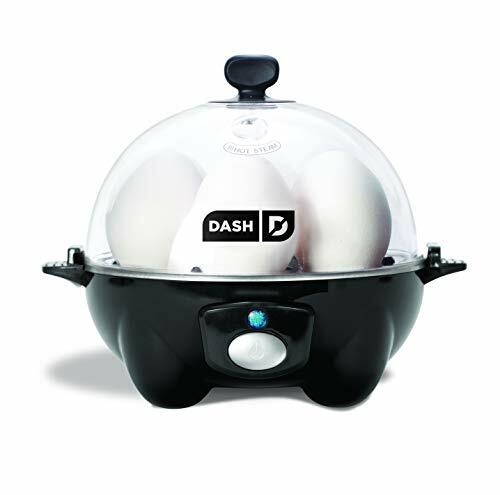 They’ve been around since 1995 and are known to create innovative and environmentally friendly kitchen appliances. Waffle dogs/Corn dogs are kid friendly. Kids LOVE to eat them. Since it makes 6 hot dogs, you can crank them out in a hurry. Allows you to make corn dogs/waffle dogs without deep frying them, keeping them much healthier than usual. Choosing your own hot dog allows you to keep it as healthy as you like. Choose chicken dogs or organic Applegate Hot Dogs. Making your own batter allows you to customize it to your liking. Regular waffle batter, bisquick, Paleo batter, gluten free, vegan or or Corn Dog batter, your choice! Slots are TOO SMALL for regular sized hot dogs. I know, that’s strange, but all you have to do is cut the hot dog in half. Batter tends overflow. It’s difficult to gauge how much you need so people tend to overfill the first few times. 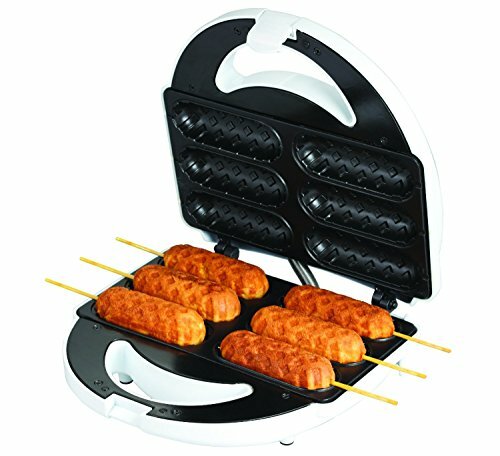 This corn dog / waffle dog maker has 3.9/5 stars on Amazon on over 280 customer reviews. Wrapping up with waffle corn dogs! If you’re in the mood to switch things up, this may be a product for you. It’s reasonably priced along with some good reviews on Amazon. Still aren’t sure? See the brief Smart Planet video below! If you do decide to go for it and start to experiment with some crazy recipes (like putting Nutella or jam on this) then I would love to hear about it in the comments below. Looking for something a little different but just as unique? Check out the Texas Shaped Belgian Waffle Maker!